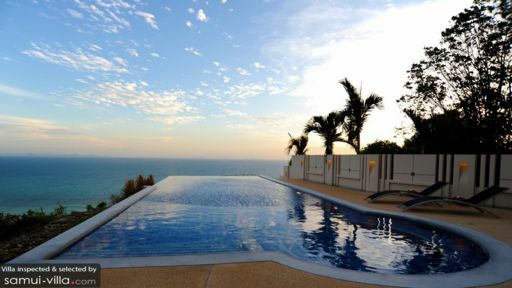 A beautiful new property nestled midst the hills of Laem Yai, Villa Akira is a five-bedroom holiday home that is more like an immersive experience with nature and its elements. With a panoramic vista of the Nathon Bay, including a gorgeous view of its sandy white beach and clear, blue waters, the beautiful scene can be enjoyed from each and every corner of the villa. 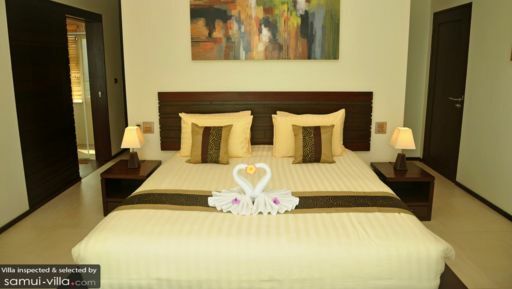 The bedrooms and living spaces all sport floor-to-ceiling glass windows and doors to ensure that guests can get the most out of this stunning location in Koh Samui! Five similarly designed and lavish bedrooms are available at Villa Akira, each of them is sea-facing providing a view that can be enjoyed on the private balcony. All the bedrooms are furnished with king-sized beds, TVs, and a lounge chair with ottoman. The bedrooms are comfortable and assuredly you are in for the best sleep ever. The air-conditioned bedrooms also have en-suite bathrooms, each fitted with a luxurious bathtub for the most tranquil bath! Perched at the edge of a cliff that is nothing but luscious and thriving nature, the 16-metre infinity swimming pool is a great spot for relaxation in the mornings right before you enjoy a delicious breakfast. The sandy pool deck also houses a few sun chairs that are for you to sunbathe and enjoy the pleasant tropical weather. Under a shaded region of the porch, there is an alfresco dining area for guests, so they have the pleasure of indulging in a hearty meal outside in the open air. Mesmerizing and spectacular views couples with good company and delicious food are the ingredients to a perfect evening with loved ones. An open-plan recreational area is accessible to guests of Villa Akira which houses an American-style bar concept, along with billiards tables and a super plush sofa to relax on. Once the sun sets, this would be a great spot to enjoy drinks with friends and family. The main living area at the villa features massive glass windows that provide a beautiful view of the bay. There are comfortable sofas, beside the windows to allow for natural lighting, and a flat-screen TV for entertainment. The minimal décor provides a cosy and homely ambiance to the space. Apart from the alfresco dining area, there is an indoor dining area in the main living area which has been set besides floor-to-ceiling glass walls so you can relish the view as you relish the delicious food. The kitchen even leads to a balcony furnished with rattan armchairs for lounging outdoors. Fully-equipped complete with a breakfast bar and chairs, the kitchen has everything you need and then some! There are many services available upon request meal preparations by a personal chef, chauffeur/car, boat rentals, etc. As you enjoy a complimentary breakfast, plan your day with the help of the generous staff because they are happy to help. 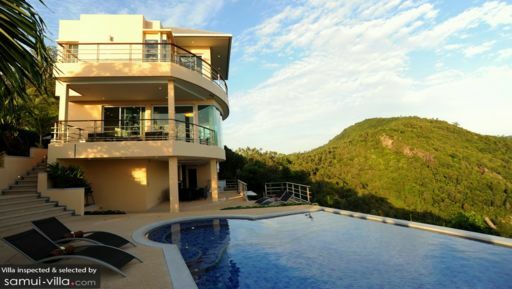 Located right on the tip of Laem Nai, the villa provides access to Nathon Bay and other places of interest in Bang Po beach. As there are not many tourists in this region, you are free to enjoy the privacy and exclusivity while you walk along the shore, and enjoy a peaceful holiday! Everything is excellent! The view and services are perfect!